Specially treated to eliminate paint bleed, ensuring sharp paint lines and a professional finish every time. Developed for use on painted walls, wood, glass or metal. Not recommended for use on delicate surfaces. 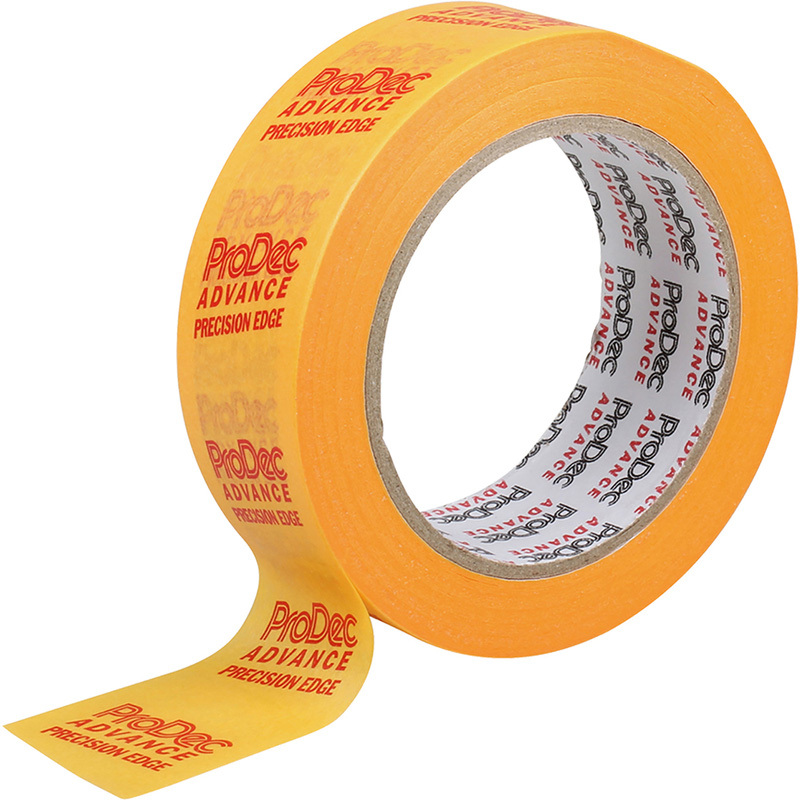 Prodec Advance Precision Edge Masking Tape 36mm x 50m is rated 4.4 out of 5 by 36. Rated 3 out of 5 by Janese from Good but not gorilla tape Bought this for modeling,being able to airbrush and leave lovely clean edges is the key to a great finish but unfortunately not with this.did a great job of nice clean lines but left tape tack everywhere,sticky residue on newly finished paint is a problem.So back to the gorilla tape less tack,no mess and clean lines..100% go for gorilla tape. Rated 5 out of 5 by Notapainter from Makes cutting in a dream. I used this product as I discovered I am hopeless at cutting in. So used to have a perfect straight line from my dark grey feature wall to the other white walls, it made painting less stressful and with almost perfect results. I would recommend not using on freshly painted walls as it will take the paint off and I would remove the tape before the wall you have just painted is completely dry, otherwise if you get paint on the tape it can take paint off the walls when removing. Love this product and I also used to protect lighting fittings and switches from paint. Rated 5 out of 5 by MetalMania from Brillant masking tape Oh why oh why have I not used/bought this sooner!? - absolutely brilliant! sticks to everything (glass, brick, laminate, plaster etc) but easy to remove too. Definitely worth paying the extra if you want a nice clean line, forget the other cheap stuff, just buy this! Rated 5 out of 5 by JoM94 from Good Quality Tape Used over 300 meters of this tape for decorating. It is a good to use with a strong feel and precision finish. Good alternative for a reliable finish over the basic masking tape. Rated 5 out of 5 by Kentheweld from Best masking tape Used this tape several times and if it is smoothed out well it leaves a very clean edge. Frustratingly it sometimes tears when removing leaving a thin sliver to restart, difficult if the paint is still tacky. Better priced than another well known tape related to amphibians.